What comes to your mind when you think of gaming laptops? Many will have the impression that these computing machines will be bulky, heavy, flashy, and expensive. While many companies are trying to change that, they usually fall short in some of the consideration factors. In a perfect world, a thin, light and affordable will be able to play graphics demanding games. To pursue this vision, Lenovo has developed their Legion Y series gaming laptops to bring gaming to the masses. Last year, we did a review of the Lenovo Legion Y520, which showed its capabilities in older game titles. As we refreshed our list of game benchmarks, we wanted to see how the refreshed Legion Y530 performs with some of the latest and more graphics intensive games as well. The Lenovo Legion Y520 had a major makeover. This year, the Legion Y530 had a totally different design as compared to its predecessor. It seems that Lenovo listened to some of the feedback given to the Y520, and improved the design and performance on the Y530. Interestingly, instead of following the common flashy design styles found on most gaming laptops, Lenovo went with a simpler design instead. Perhaps, this can make the Legion Y530 more acceptable to users who wants the laptop for professional work too. The Lenovo Legion Y530 comes with different SKUs. If you were to purchase the unit directly from the Lenovo website, you can actually configure the unit to your preference. The system is powered by the latest 8th Generation Intel Core processor, which comes in the form of either a Core i5-8300H Quad Core processor or a Core i7-8750H. On the graphics side of the house, it starts with the NVIDIA GeForce GTX 1050. The system can also be pre-configured to a faster GTX 1050 Ti or GTX 1060 as well. In fact, the specifications on the Lenovo Legion Y530 seems to be very similar to that of the ASUS TUF Gaming FX504 gaming laptop which we have tested previously. Moreover, both gaming laptops (configured to the most similar possible specifications) is priced similarly at the S$1,700+ range as well. While we have previously seen the lackluster performance on the FX504 due to some inherent software issues, we can finally understand the full performance potential of such a system. In our tests, for comparison sake, we will put the Legion Y530 up against the TUF Gaming FX504. 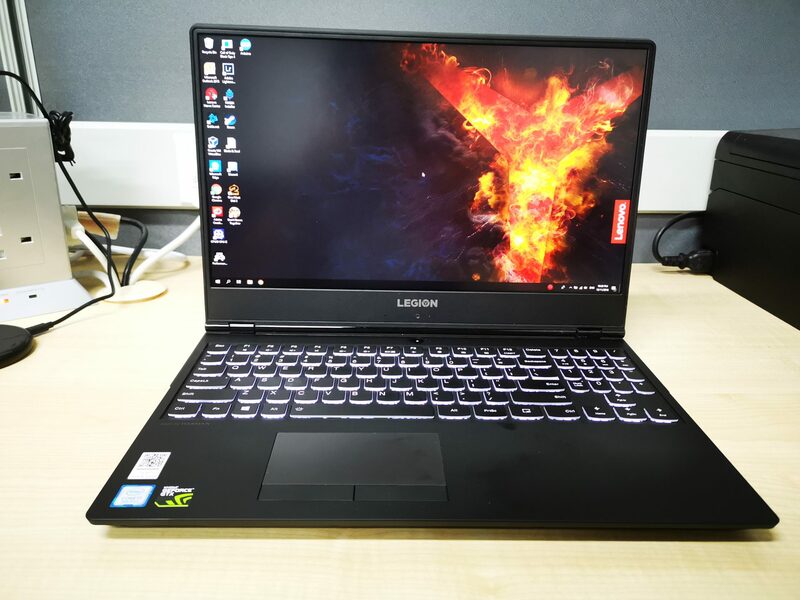 The overall aesthetic design of the Lenovo Legion Y530 looks quite unique, especially for a brand that focuses on gaming. Lenovo cleverly designed the system to look slim by tapering the chassis, but in fact, when you actually look at it, it is actually thicker than expected. Nonetheless, such a design does make it look a lot better than usual gaming laptops, which largely disregards such design details. This is also why the Y530 still weighs 2.3KG. We realised that most of the main ports of the unit comes at the back of the unit, leaving the sides with only 2 x USB 3.0 ports and a Microphone/Headphone combo jack. It somewhat makes sense, as you would likely not use more than 2 USB devices. However, when you require quick access to the display output ports or USB ports at the back, you will actually need to turn the unit around or move to the back of the laptop to access them. It may not seem as user friendly as traditional designs, where all ports are just located at the side. While it does make sense to have the display output ports and power jack at the rear, which can lead to better cable management on your workstation desk, it would have made more logical sense to place the USB ports to the side for easier access. The back of the unit has a nice brushed metallic finish, which makes the system looks premium and sturdy. Additionally, the LEGION logo also adds an extra touch to the branding of the device, especially with the “Y” shaped LED light. The keyboard layout on the Legion Y530 is acceptable, as it was easy for us to get used to typing on the system. Instead of cramming the keys on the keyboard like the FX504, the Y530 managed to find space to space out the directional keys by making the numpad smaller. This brings about a side effect, where, the NumLock key is awkwardly placed next to the “0” numpad key, and the “/” and “*” keys are now placed to the right side of the numpad, instead of the top. Therefore, users who frequently make use of the numpad will need some time to get used to the new layout. On a side note, the keys are also backlit, so that you can work or game in dark environments as well. The Lenovo Legion Y530 stands out from all other gaming laptops as it has a really thick bezel on its display. It allows the unit to look refined and very much like a premium device. However, because of such a design, they had to place the webcam at the bottom of the display instead. Yes… the unit is infected with the “nose hair” webcam syndrome. This design leads to a rather unnatural and weird camera angle on the user. The specifications of the ASUS TUF Gaming FX504 used for this comparison is the same as the article of the Review of the ASUS TUG Gaming FX504. However, do take note that the ASUS TUF Gaming FX504 which we have tested had an issue of not being able to turbo boost to higher speeds when on load. Do take this comparison as a pinch of salt, as we believe that ASUS can issue a fix to the problem. However, with the Lenovo Legion Y530, we do hope to see the full capabilities of a system with such specifications. Based on the synthetic benchmarks by UL Benchmarks, we can see that the Legion Y530 performed better than the ASUS TUF Gaming FX504 in all gaming and productivity cases. We have a few hypothesis on such a score, which we will further discuss with the results shown in the rest of the review. For both CPU based benchmarks, the Lenovo Legion Y530 fared much better than the ASUS Gaming FX504. This is likely due to the cause of the CPU P-state issue on the TUF Gaming FX504. Nonetheless, the scores on the Legion Y530 showed the potential of the Core i7-8750H in its full glory. This really sets the Legion Y530 apart. Interestingly, the memory performance on the Legion Y530 is more than twice better than that when compared to the ASUS TUF Gaming FX504. In Singapore, all ASUS TUF Gaming FX504 only comes with a DIMM of 8GB RAM. This has caused the memory to run in single channel, which is the cause of the lackluster memory performance. On the other hand, with 2 x 16GB of 2666MHz DDR4 RAM installed and operating in Dual-Channel, the performance difference was simply apparent. The Lenovo Legion Y530 comes with a PCI-E based NVMe SSD. With further checks, we confirmed that it is actually a Samsung PM981 OEM drive. This SSD is rated to run extremely quickly, as it is not bottlenecked by the usual SATA interface. As seen on the CrystalDiskMark benchmark, the sequential read and write of the drive both breaks 1GB/s. For example, it only takes 4 seconds to transfer a DVD worth of video to/from this drive! It’s actually rare to see PCI-E based NVMe SSDs on such kinds of mainstream gamer systems which focuses on affordability. By including the Samsung PM981, Lenovo has shown us their commitment to no compromise in terms of the selection of components when it comes to the Legion Y530. Similarly, as expected, the Lenovo Legion Y530 also performed a lot better in games than the unadulterated TUF Gaming FX504. Interestingly, we did not know that there could be so much difference in terms of the performance in games, as the TUF Gaming FX504’s problem was only largely CPU related. It seems like the differences in CPU, RAM and Disk performance could also bring about significant frame rate improvements as well. We also saw that the GTX 1050 Ti is still largely not good enough for more graphically intensive games at medium settings. Regardless, if you only play less graphics intensive games such as DOTA2, this graphics card will perform sufficiently for a smooth gameplay. While we were benchmarking the system with the Cinebench R15 setup, all CPU cores and threads were running at 100%. The temperatures also shot up to over 80-degree Celsius (and some even 90), but there were no signs of throttling of the CPU below its base clock. At this point of time, we also saw that the CPU was running in Turbo Boost P-State at 3.06GHz, unlike the ASUS TUF Gaming FX504 which only runs at 2.2GHz. This also explains the higher performance produced by the Legion Y530. Despite its high performance, the CPU temperatures recorded were rather high, and it is expected that the system will throttle if such a load to the CPU was sustained for a longer period of time. We saw the limitations of the cooling solution of this system in the test above. Therefore, if you are looking to have the Legion Y530 to run your application that maximizes the capacities of the CPU, you should probably look an alternative solution. Regardless, the Lenovo Legion Y530 brings about great value and performance to gamers. This is definitely a system that hits the sweet spot between price, performance and portability. If you are buying a new gaming laptop but have a limited budget, the Legion Y530 will be a good choice.